A complicated, tangled, and long, long story. As soon as the USA began work on the A-bomb, the theoretical division at Los Alamos was designing the H-bomb--AKA "The Super." This is where Edward Teller comes in. Teller is/was considered the inventor of the H-bomb. Now, Teller was probably the most vocal proponent of the H-bomb among his fellow scientists--in the USA, but it is clear, from Tellers own words, even, that he alone did NOT invent the fusion weapon. The H-bomb was developed by huge teams of people. By 1945 Los Alamos alone had a population of 10,000. Of course, that doesn't include the national number of personnel involved. To understand where Teller is coming from, you have to realize that he lived through WWI as a child--and later--narrowly escaped the Nazi's turf! He writes of having "night terrors" as a child. Later he says that his night terrors were nothing compared to the actual nightmares his childhood friends ended up living--and dying--in the Nazi death camps. It's a VERY powerful moment in the book. Visceral. To add to the misery of that time, he describes a trolley car incident that ended up cutting off his foot. Oy vey! He grew up in a solid middle-class Jewish family. He was fixated on numbers as a child--so his father set him up with a private math instructor. He also was an accomplished classical pianist. His mother was a piano teacher. Anyway, the dude saw fascism up close and personal. That, in many ways, explains his conservative paranoia. Aside pushing for the H-bomb, he was later a "Star Wars" advocate during the reactionary Reagan era. In addition, he went to his grave thinking that nuclear energy was the savior of man. Leo Szilard couldn't drive, so he asked his buddy, Teller, to drive him over to Al's (Albert Einstein) house. Leo had typed up a letter to President Roosevelt and wanted Al's blessing and signature. Yes, this is the famous letter telling Roosevelt that it was critical that the US build an A-bomb before the Germans. In a famous film you see Einstein reading the letter; the other guy pictured there is Szilard. I have no idea who filmed it, but Teller was in the room, also--I mean, he was Szilard's ride home. So, Teller knew all the main players and was in on the A-bomb deal from day one up until Reagan's kooky Strategic Defense Initiative (SDI)--AKA "Star Wars." The fact that Los Alamos was such a massive political nightmare, it's hard not to be amazed that the job of creating an A-bomb actually got done. But Los Alamos WAS, indeed, a "galaxy" of physics and math stars. Atomic bomb research developed computer technology exponentially. If computers wouldn't have been used in doing the astronomical calculations--the A-bomb would have never been actually built. I did not know this. 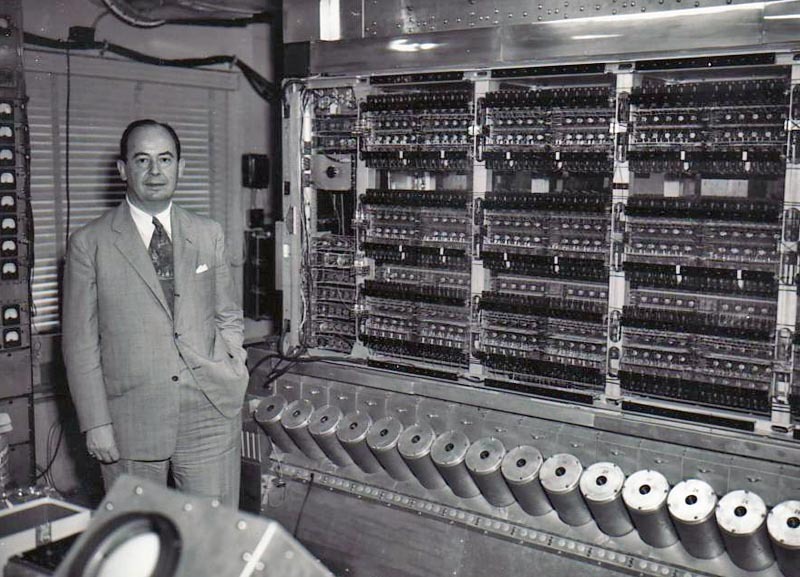 In fact, John von Neumann ran some calculations figuring out how long it would've taken to develop the A-bomb without computers. He concluded that it would take something like 400 mathematicians working 7 day a week, 24 hours a day, 100 years to complete the calculations needed! Holy moly! And we're talking primitive, 100% mechanical computers here! Bizarre looking devices that looked more at home in an old steam laundry than a lab. Man, I have no--as in ZERO--understanding of how these computers were designed and built. Mind blowing--in my opinion. When it came to politics, Ed was a bit kooky. He characterized the protestors of Vietnam as "violent." Say what? People we're being DRAFTED and killed, Ed. Not people like your beloved Reagan's kids or George H. W. Bu$h's cowardly brood. And I'm sure your real fine son, Paul, didn't have to play with "Charlie" over in Indochina, either. Now, there were some dopey miscreants that spray painted "warmonger" on your house. That's wrong. However, nothing like 4 people being shot at Kent State by your, ahem, "non-violent" buddies. Sorry, Ed, ya lost me there. And I just don't understand your insane lust for nuclear energy. Especially when compared to your short-sighted view of alternative energy sources. Leo Szilard and Johnny von Neumann were forward looking. You, not so much, Ed. Did you feel bad that nuclear energy was, in your mind, the only peaceful use that could possibly counteract the A-bomb's "evil"? I'm here to tell ya, Ed, you don't have to feel guilty in the least bit. The scientific achievement of nuclear weapons is monumental. Absolutely, no-doubt-about-it AMAZING. And brutha, you were there and helped. You're a GIANT of science--PERIOD! Anyway, I was annoyed by his absolute lack of vision as far as green energy was concerned. Also, his pooh-poohing of the dangers of nuclear power was irritating and deliberately played down. Now, I do agree that we fear radiation probably far too much out of ignorance. However, I still wouldn't want to live a few miles away from the Fukushima nuclear plant. And maybe Teller's idea of putting them underground is a good idea. In any case, the safety of nuclear energy is far from being settled--even today. Yeah, the guys and gals of Los Alamos were brilliant beyond belief, but they were also world class slime balls when it came to office politics. Whew! Teller backstabbed Oppenheimer, but Oppenheimer was a pro backstabber, as well. It was a crazy, paranoid world. Also, it's hard being a human in this universe--and they were only human--after all. Some people consider Teller the real life Dr. Strangelove. Now, that's an amusing comparison--but has very little, if anything, to do with reality. He was a very weird and complex man. And the dude was definitely a physics maestro. Teller's life and times is nothing short of amazing. It was jammed-packed with amazing events and people. This memoir is a must read for people who want to understand the history of that time--and Los Alamos.